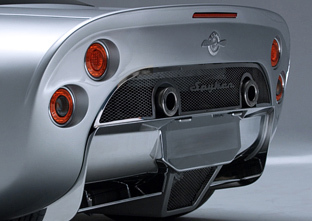 Netherlands based manufacturer Spyker chose the 2009 Geneva Motor Show as the venue to unveil the C8 Aileron, a second generation sports car from the company which has been producing high-end sports cars since 2000. 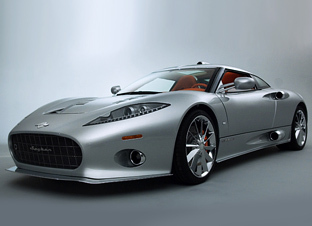 Victor R. Muller, Spyker Cars' founder and Chief Executive Officer said of the car. 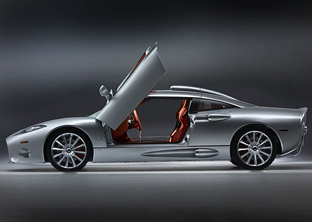 "The C8 Aileron's design is heavily inspired by Spyker's aviation heritage, as was the case with all previous models, but with a clear emphasis on the second-generation aircraft propulsion: the turbine rather than the propeller that adorned so many elements of the first-generation cars. Similarly the "Aileron" name pays tribute to that aviation heritage. 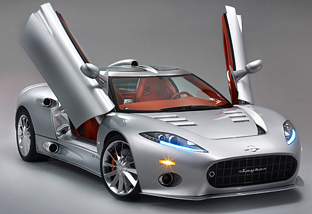 It is the device that makes an aircraft turn and symbolizes the turning point that the Aileron is for Spyker: the car which will turn the company towards long-awaited profitability." In order to improve the aerodynamic efficiency of the C8 Aileron, several changes to the exterior styling were carried out, such as extending the canopy backwards. Most of the shark-like gills have been removed, which results in a sleeker, smoother appearance. The front end is now dominated by a larger grille that provides additional cooling. Also the rear diffuser was redesigned for improved performance. An additional spoiler has been positioned under the diffuser, providing extra downforce to boost the ground effect created by the diffuser. The split side windows which featured on the previous model have been replaced by more practical single-pane side windows that are fully retractable, improving driving comfort. 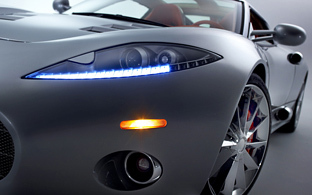 Much of the lighting on the Spyker C8 Aileron is composed of LED units including the taillights and indicators. The headlights also feature LED strips which act as daytime running lights. 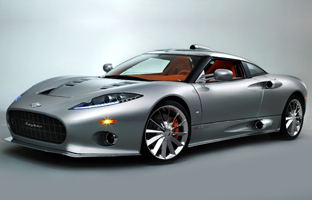 Powering the Spyker C8 Aileron is an Audi-sourced 4.2 litre V8 engine which provides 400 horsepower. Two transmission choices are available, a 6-speed Getrag manual, and a 6 speed ZF automatic which comes as standard with paddle shifters mounted behind the steering wheel. 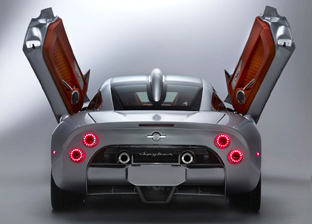 The 0-60 time is a very respectable 4.5 seconds while the top speed is 187 mph. 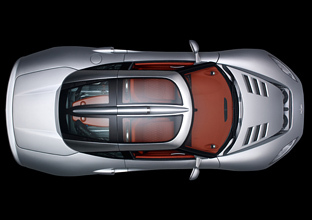 Inside the same exquisite level of trim and engineering is carried over from the previous Spyker models, although the design has been significantly altered. The interior is made of the highest quality leather, from the Litano range of the Dutch Royal Tannery Hulshof. The leather interior is available in 14 standard colours, but any other colour can be specially ordered. 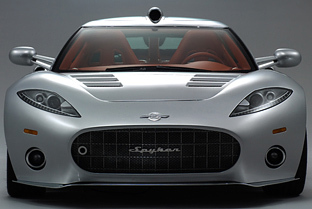 The dashboard of the C8 Aileron was completely redesigned to suit the new Spyker identity and to improve ergonomics and functionality. Air vents are designed in turbine style and the performance and distribution of the air conditioning was improved significantly. A multifunctional LCD display is integrated between the speedometer and the odometer. The middle console accommodates the standard Kharma sound system. Chronoswiss dials and switches are available as an option.